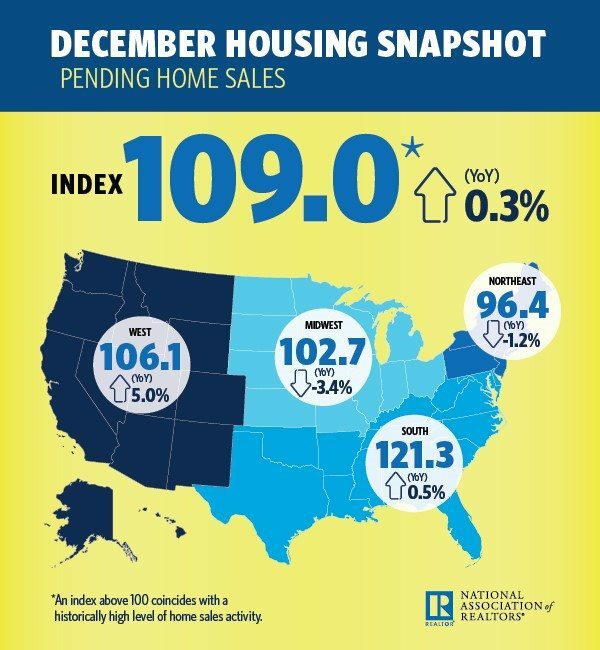 In November, NAR's Pending Home Sales Index declined 2.5 percent to 107.3 from 110.3 in October. This month, the PHSI rebounded with a 1.6 percent increase to 109.9 — 0.3 percent above December 2015. While the National Association of Realtors’ Existing-Home Sales Report signaled an “autumn revival” last fall, the Pending Home Sales Index (PHSI) painted a bit of a different picture, with rollercoaster indices that took a sharp turn downward in November thanks to continuing inventory problems and increasing mortgage rates. Thankfully, the latest PHSI have ticked slightly upward — a welcome ending to a nail-biting year. “Pending sales rebounded last month as enough buyers fended off rising mortgage rates and alarmingly low inventory levels to sign a contract,” said NAR Chief Economist Lawrence Yun in a statement. December’s PHSI jumped to 109.0 — a 1.6 percent increase from November’s 107.3. The PHSI in the Northeast dipped to 96.4 and is 1.2 percent below a year ago. In the Midwest, the index declined to 102.7, and is now 3.4 percent lower than December 2015. Pending home sales in the South rose to an index of 121.3 — a 2.4 percent month-over-month and 0.5 percent year-over-year increase. The West experienced the biggest gains with an index of 106.1 — a 5.0 percent month-over-month and year-over-year decrease. Yun says the health of the 2017 housing market will continue to be dependent on borrowing costs, consistent job growth, and more affordable available inventory at the $100,000 to $250,000 mark for first-time buyers. “The dismal number of listings in the affordable price range is squeezing prospective first-time buyers the most,” said Yun.